Midway Drive near Barnett Ave. was closed down after a water main broke and sent water onto the roadway. 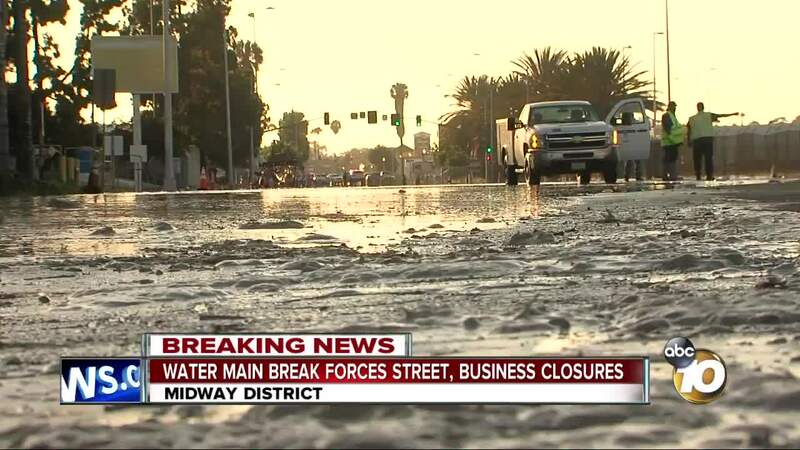 SAN DIEGO (KGTV) - A water main break in the Midway District on Sunday night forced road closures in the area and prompted a nearby restaurant to close early. 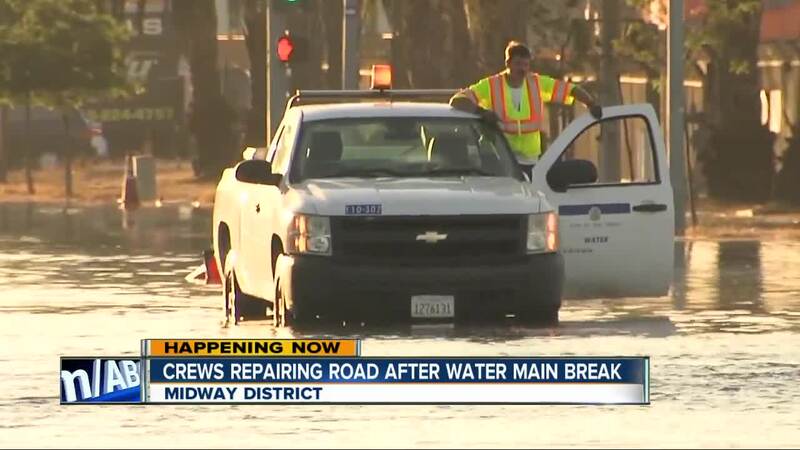 The water main break happened in the 2700 block of Midway Drive, between Barnett Avenue and Rosecrans Street. The roadway was closed in both directions due to flooding. The closure was reported at 5:08 p.m., according to the city's Water Department. City Public Information Officer Arian Collins said the cast-iron transmission water main is 18 inches in diameter; he noted that the section that broke was 20 feet long. On Monday morning, Collins said crews have been working through the night in hopes of restoring water service by 2 p.m. He told 10News approximately 30 customers were without water service as of 8:30 a.m.
On Barnett Ave., the Italian restaurant Volare shut down three hours early due to the water main break. "We were actually trying to trying to make drinks for people, fill up water, and sodas and there’s no pressure, so we thought it was something inside our building," said Antonella Pascucci, a daughter of the restaurant's owners and an employee. Looking out the window, she saw the restaurant had become waterfront property. "You could pretty much jet ski out there," Pascucci said. A restaurant regular, Karen Lemieux, said she'd been coming to the family owned restaurant every other week for 10 years. She was saddened to see the paper sign on the door that read, "Closed due to water main break." "Disappointed, but we’ll come back this week," she said. "We’re losing our Sunday night crowd, which is a good night for us, so it’s unfortunate for all of us," Pascucci said.